Spot silver prices mirror the general malaise within the commodity markets at present with most of the metals and energy complex trading in a relatively narrow range against a backdrop of thin markets and the start of the US earnings season which will set the tone for this week. For the past two weeks we have seen silver prices trade between $17.54 to the downside and $18.24 to the upside, with yesterday’s price action running into resistance from the 14 day moving average – so not an encouraging signal short term. 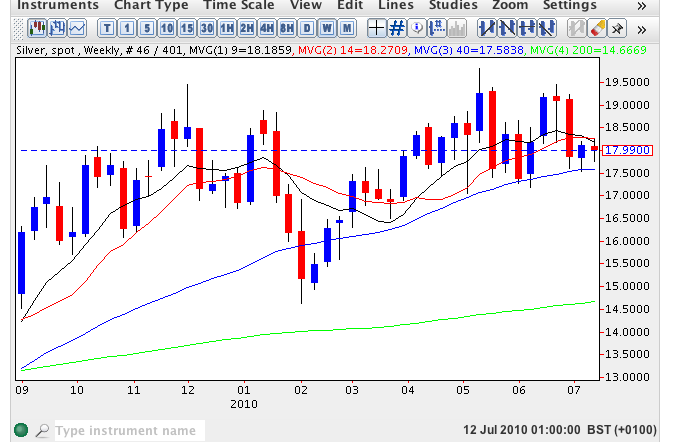 However, the 200 day moving average below has yet to be breached and once we see some momentum in the commodity market in general we should expect to see spot silver break higher, first clearing all three short term moving averages, followed by a break above $19.45 per ounce in due course.